In many ways, King Solomon’s Mines was the Star Trek of its day. A voyage into unknown lands, discovering mysterious, alien people, slaughter on an unimaginable scale and a strict adherence to British ethics and values: it has all the hallmarks of any good Star Trek book. The story begins with a chance meeting between the hunter, Allan Quartermain, and Sir Henry Curtis who is seeking a brother he has mislaid. It turns out that the brother set off for King Solomon’s Mines and, would you believe it, Quartermain just happens to have a rough sketch map of how to get there. So, after agreeing that Quartermain can get a whole heap of diamonds if they make it, the two of them and another Englishman set off to find the mines, even though they know that it is almost certain death to do so. To help them in their journey they conscript a number of local men one of whom seems regal in bearing – this is significant to the later plot. The casual racism in the book, which we see in their reactions to and relations with the African men, is jarring to modern ears, but the book was written in 1885 in perhaps less enlightened times. However, Haggard does veer from the usual Victorian mores by describing some African men as noble and virtuous, and including a relationship between an Englishman man and an African woman, which he describes very positively, that must have been shocking at the time. The journey includes deadly wild elephant hunts (horrifying to modern readers, but, no doubt, exciting in their day), near death by dehydration, stumbling upon corpses of previous adventurers, white men impersonating gods and ends with a battle bloodthirsty enough to keep even E entertained. It is a real rollercoaster ride, if you like that sort of thing. The manoeuvrings of the final battle bored me a bit, but the rest was a really fun read. The book feels, in many ways, like a more British version of Indiana Jones. King Solomon’s Mines was, apparently, written by the author when, after being totally underwhelmed reading Treasure Island, he bet his brother five shillings that he could write a better book. It was, apparently, the first English adventure novel set in Africa. When it was first published, London was covered in billboards reading “King Solomon’s Mines. The Most Amazing Book Ever Written.” I don’t know that I would go that far, but it was a rollicking read. 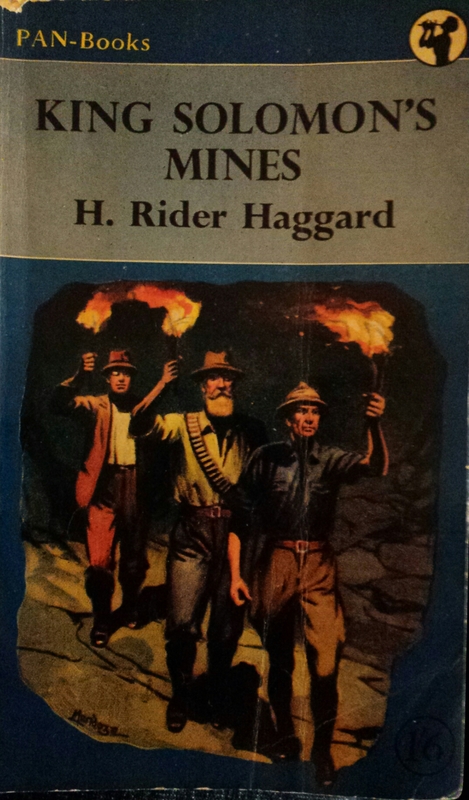 Tags: adventure, Africa, book, book review, books, diamonds, H Rider Haggard, King Solomon's Mines. Bookmark the permalink. I’d be interested to get your take on She. What is She? Another book by Rider Haggard?